There’s some big talk from Eugen Systems, creators of the Wargame series and Act of War. 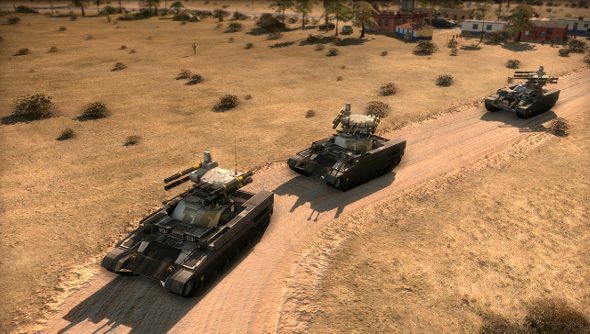 The strategy developer aims to launch us back into the RTS “Golden Era” with a sort-of-sequel to Act of War, Act of Aggression. Some pre-alpha gameplay has escaped from the studio in the form of a new trailer, so why don’t you take a look? Act of Aggression pits three future factions against each other using advanced, but recognisable technology to get the upper hand. There’s the sly Cartel, built out of PMCs, with fancy prototypes and skill in subterfuge; the brute force veterans of the US Army, using older tech, but strengthened by experience; and The Chimera, an adaptable international faction with a plan for every problem. Expect traditional RTS shenanigans like base construction, resource management and hordes of units colliding as they try to dominate the map. But Eugen have spent the last few years working on the highly technical, deliciously complex Wargame series, so Act of Aggression will come with some twists. Take a gander at hisAct of Aggression previewfor his full impressions. It’s due out this spring, and there will be a VIP beta launching in the coming months.